Whenever I visit my sister, Courtney, in Phoenix I always enjoy dinners with the fam, mani-pedi sessions, and impromptu shopping trips. My skin, on the other hand, lacks the same enthusiasm. The dryness in Arizona compared to Los Angeles is insanely different and I have to make sure to take extra precaution with my daily regimen so I don't look like a lizard when I go home. Pure Suisse Laboratoire has innovated a new scientific approach to your beauty regimen. Their Inside and Out Beauty System comes with a Hydrating Wrinkle Cream for the outer layer of skin as well as Food Supplements for the entire body. It leaves my skin looking and feeling soft after the first use! I always trust companies out of Switzerland with my skin care. This two part system is no exception. The paraben free is made with 100% Natural Swiss Edelweiss which has been dubbed the unofficial flower of Sweden and has been proven to aid in anti aging. Sign me up! The Pure Time Stop Food Supplement is as all natural as it's counterpart, boasting many beneficial ingredients such as Green Tea Extract, Grape Seed, Vitamins C and E, and Bilberry. What is Bilberry you ask? This member of the berry family acts as a skin conditioning agent that improves vitality and was used back in World War II by fighter pilots to improve their night vision! Beauty: Beauty comes in all shapes and forms. Quality: Switzerland offers a high level of quality. Nature: Pure nature is an eternal source of inspiration and offers a wealth of active ingredients. Performance: Combinations of cosmetics and food supplements deliver high-level beauty performance. Research & Development: Research on the combined effects of cosmetics and food supplements will improve the quality of beauty-care systems. Pure Suisse also has products developed to reshape skin with collagen boosts and clarifying systems to deliver a lighter, harmonized complexion. These creams and supplements can be found easily on the Pure Suisse website where they can also be purchased and shipped directly from the manufacturer. Thank you, globalization. 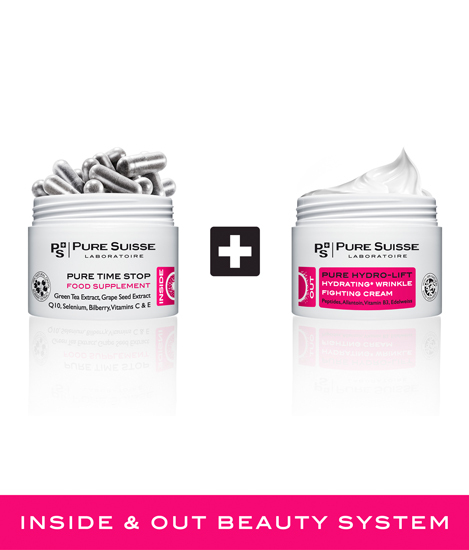 Pure Suisse Grape Food Supplement and Wrinkle Fighting Face Cream sell for $40 each on PureSuisse's website. Personally I think the supplements are my favorite. Right now you can get 50% off any combined set. Use discount code BELLAS BEAUTY at checkout. For every 10 sets ordered, a free set will be given out! Who wouldn't want that? I love Pure Suisse, and I think you will too. Hi! I like your blog, it's so cute!